There have been plenty of late inning comebacks, enough to where if the team lost half of those games, they’d be fighting the Pirates for third place. I guess baseball evens itself out, but this felt like a winnable game. Cincinnati manager Bruce Price turned to Raisel Iglesias for the 8th and 9th innings and his wildness nearly gave the Cardinals the win. Matt Carpenter walked and Yadier got hit with one out. Iglesias threw a wild pitch to move both runners into scoring position. Piscotty reached for a breaking ball off the outside corner for strike three and Jhonny Peralta busted his bat on a grounder to end the inning. 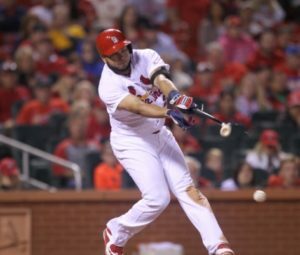 In the ninth Pinch-hitter Kolten Wong hit a triple off the right field wall and the Cardinals has the tying run 90 feet with no outs and didn’t score. Aledmys Diaz grounded to third, Greg Garcia hit a shallow fly ball to left forcing Wong to stay at third. Pinch-hitter Jedd Gyorko tapped out to third on a 2-0 pitch. After the Giants also pounded out 12 runs the night before they were shutout 2-0 to keep St. Louis one back in the wild card. The Mets grabbed a 5-2 win increasing their lead for the top spot.